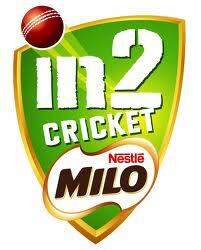 MILO in2cricket was once again held at Glenora District High School, running for nine weeks up to the end of 2012. "There were 42 participants who turned up each week to enjoy a wonderful program," co-ordinator Annie McKenzie said. "It was great to see so many parents getting in and helping out." 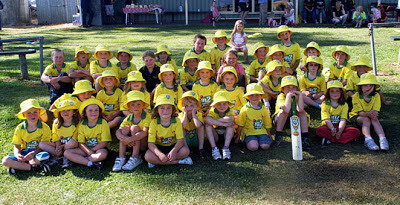 The final session was held at the Gretna Recreation Ground, where a representative from Cricket Tasmania joined in the fun. A barbecue was provided by the Gretna Cricket Club, adding to the enriching experience of the last day. On December 14 the group was lucky enough to attend the first test between Sri Lanka and Australia at Bellerive Oval. Twenty-one of the group were selected to be part of the opening ceremony and all the students went on the ground to be part of the entertainment at lunch time. The highlight of the day was joining Ricky Ponting on his lap of honour around the ground. The youngsters who took part in In2Cricket at Glenora this summer. On behalf of the Gretna Cricket Club and the Milo cricketers I would sincerely like to thank Annie Mckenzie for all her hard work in running the Milo in2cricket program, not only for this year but for the past three years. Annie's dedication towards the kids has been second to none and without her commitment the kids wouldn't have the opportunity to experience what cricket has to offer. The Milo in2cricket program is a great introduction to cricket for kids aged five to 10 years. Having this program up and running has provided the Gretna Cricket Club with many new junior players into the Under 13s and then onto the Under 15s and in the future on to senior level. For this our club thanks you Annie for all you hard work. Also thank you to all parents and Gretna Cricket Club senior players that helped out over the nine weeks.